Purpose: The purpose of this study was to determine the effects of dental magnification loupes on posture during instrumentation. Methods: A convenience sample of 27 right-handed dental hygienists, with no prior history of injuries or disabilities of the head, neck, or trunk region, enrolled in the study. Baseline posture calibration was taken and tri-axial accelerometers were placed on four locations of the head and trunk (occipital region of head; cervical vertebrae C5; thoracic vertebrae T5; lumbar vertebrae L1) to measure acceleration and the orientation of the body to gravity. Participants were randomly assigned to wear self-supplied magnification loupes during either the first or second half of the session. Dental chair mounted typodonts, prepared with artificial calculus, were used to represent a simulated oral environment. Participants were asked to explore all areas of the mouth using an ODU 11/12 explorer. Mean accelerations of the three axes were used to compute average forward/backward (AP) and side to side (ML) tilt of each accelerometer recorded during the instrumentation sessions. An end-user opinion survey was completed by each participant at the conclusion of the session. Results: No statistically significant differences in posture were revealed between the sessions with the participants wearing their loupes and not wearing loupes. However, data from the end-user survey indicate that 74% of all the participants strongly agreed that magnification loupes made exploring easier and 67% strongly agreed that they felt that magnification loupes improved their posture. Conclusion: While the majority of participants perceived that their magnification loupes enhanced their posture and made exploring easier, data from this study provided little evidence to suggest that wearing loupes leads to improved body orientation. Future research needs to examine the declination angle of ergonomic loupes and its relationship to neck and trunk flexion. Previous studies have focused on the subjective posture measurement of the participants have not taken into consideration the style and fit of the magnification loupes. However, it is possible to measure posture quantitatively through the use of an accelerometer. The accelerometer is a device that is sensitive to accelerations in three perpendicular areas, including the force of gravity which acts vertically toward the ground. If the three axes are approximately aligned with the anteroposterior axis (AP: front to back), mediolateral axis (ML: left side to right side) and vertical axis (VT: head to toe) of the body, the mean value of each axis can be used to estimate the orientation of the accelerometer axes relative to gravity. From these measures, the average anteroposterior (AP: forward/backward) and the mediolateral (ML: side to side) angles can be determined. The aim of this study was to objectively assess the effect of magnification loupes on AP and ML posture during simulated instrumentation sessions on typodonts involving full-mouth exploration. A convenience sample of 27 (n=27) right-handed, licensed dental hygienists (26 female and 1 male) enrolled in the study. Participants were recruited via Internet and informational flyers and were pre-screened over the phone to ensure that they met the inclusion criteria of being a right-handed, licensed dental hygienist who owned magnification loupes and had no previous history of MSDs, disabilities or injuries of the right wrist, forearm, shoulder, neck, upper or lower back. The Institutional Review Board of Old Dominion University approved this study and informed consent was obtained from each participant. Fifty-dollar incentive gift cards were given at the end of the study sessions. Participants ranged in age from 20 years to over 50 and the number of years in clinical dental hygiene practice ranged from 1 to 20 years. The participants provided their own magnification loupes from range of manufacturers. The use of headlights was excluded from the study. A baseline standing posture was recorded with the participant maintaining their back against a flat wall, prior to beginning the session. 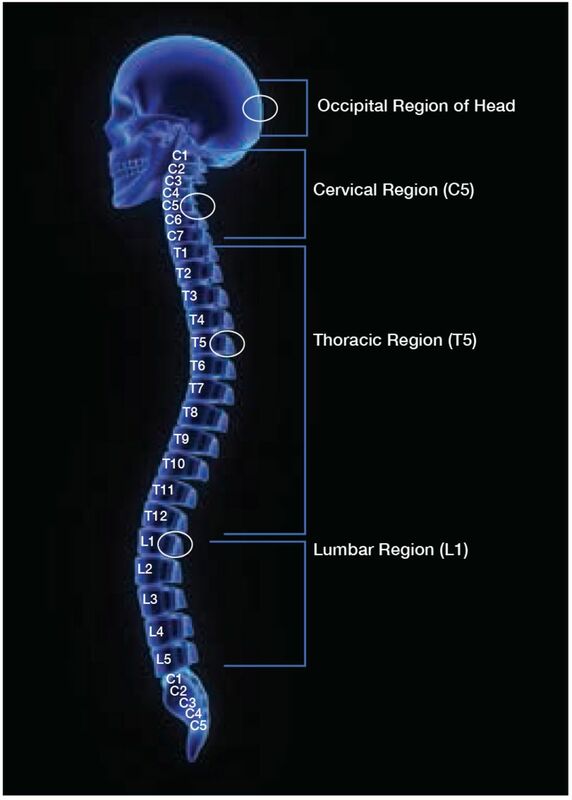 Placement points for the triaxial accelerometer sensors were as follows: occipital pole of the head, cervical vertebrae 5 (C5), thoracic vertebrae 5 (T5), and lumber vertebrae 1 (L1). A schematic of the sensor placement is illustrated in Figure 1. Prior to placement of vertebra sensors, each participant's skin was wiped with an alcohol pad and sensors were attached with double sided tape. A “swim cap” fitted with an accelerometer sensor was used to quantify measurements of head movement. Average accelerations in the three axes (AP, ML, VT) were used to compute the mean anteroposterior (AP: forward/backward) and mediolateral (ML: side to side) angles during each trial. To ensure standardization, a one minute warm-up period was given to each subject to adjust to the equipment. Typodonts (Columbia Dentoform Corp™, Long Island, NY) were prepared with artificial calculus (Paradigm Dental,™ Escondido, CA) and mounted to dental chairs for the simulated clinical environment. A pilot test was conducted to establish a baseline for sufficient amount of time for each individual to complete full mouth exploring. Participants were supplied with an ODU 11/12 explorer (HuFriedy,™ Chicago, IL) and were randomly assigned to begin the exploring session either with or without their magnification loupes. Each participant received an identical narration of instructions before starting each treatment sequence. Participants were instructed to explore all four quadrants of the typodont starting with the distobuccal surface of the first tooth in the upper right quadrant, using their normal instrumentation technique, for up to five minutes. A new typodont was supplied to the participants when they switched from using loupes to not loupes and vice versa. At the end of the session, participants were asked to complete an end-user, post opinion survey on Survey Monkey.™ The survey consisted of demographic information (age, gender years of clinical experience), and two questions related to using magnification loupes: “Overall, do you feel that wearing magnification loupes made it easier to explore in all areas of the mouth?” and “Overall, do you feel that wearing magnification loupes improved your posture during exploring in all areas of the mouth?” Responses were scored on a Likert type scale (5-strongly agree to 1-strongly disagree). All procedures were completed in one session lasting approximately 1.5 hours. Delsys Trigno System and EMGworks Software (Natick, Massachusetts) was used to collect the data obtained from each accelerometer. Prior to analysis, data was down sampled from 150 Hz to 50 Hz. Data were subsequently filtered using a fourth order Butterworth filter with a 20 Hz cutoff. The accelerometers were sensitive to the orientation to gravity, so that an axis aligned with vertical recorded an acceleration of 1g (acceleration due to gravity). If the sensor was tilted from vertical, then each axis would measure a proportion of 1g directly dependent on the angle of alignment. The average acceleration in each axis was computed for each trial. Using basic trigonometry, the average angle of the device in the AP (APangle) and ML (MLangle) planes was computed.23,24 Baseline postures were recorded for calibration purposes. The average angles from the calibration trial were subtracted from the AP angle and ML angle to provide the angle of tilt from the neutral position. Negative angles indicate forward AP angle or left side ML angle. Separate paired samples t-tests (loupes vs. no loupes) were used to assess for differences in each dependent variable: APangle (forward/backward tilt relative to gravity), MLangle (side to side tilt relative to gravity) for each of the four sensors (head, C5, T5, L1). Chi-square was used to analyze survey question results. All statistical analyses were performed using SPSS 21 statistical software with the level of significance set at p < 0.05. Twenty-seven licensed dental hygienists (26 female and 1 male) enrolled in the study, however, data from two participants proved to be unusable due to corruption of their data files. resulting in a final sample population of 25 (N=25). Years of clinical dental hygiene practice ranged from 1 to 5 years (n=15), 6 to 10 years (n=7), 11 to 15 years (n=3), 16 to 20 years (n=1), and 21 years and over (n=1). Participant ages ranged from 20-29 (n=13), 30-39 (n=9), 40-49 (n=4), and over 50 (n=1). The mean and standard deviation for AP and MLangles at each accelerometer location are shown in Table I. Accelerometer at the occipital pole of the head, revealed no statistically significant difference in APangle while wearing magnification loupes (M=-35.46, SD=9.86); t(24)=.385, p= .703 when compared to not wearing loupes (M=-35.96, SD=10.72). Results for the MLangle at the occipital pole also revealed no statistically significant difference between loupes (M=.53, SD=6.06); t(24)=.084, p = .934 and not wearing loupes (M=.59, SD=6.48). 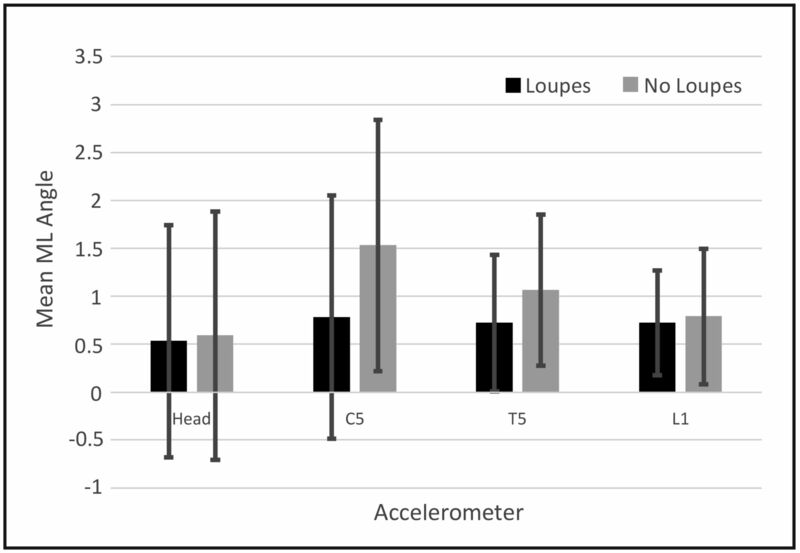 The APangle for the accelerometer placed at C5 approached the level of significance, but revealed no statistically significant difference in mean postural angle while wearing loupes (M=-31.54, SD=10.65); t(24)= 1.789, p= .086, compared to not wearing loupes (M=-34.54, SD=15.33). Additionally, there was no statistically significant difference in the MLangle at C5 while wearing loupes (M=.78, SD=6.35); t(24)=.76, p= 2.31, compared to not wearing loupes (M=1.53, SD=6.53). 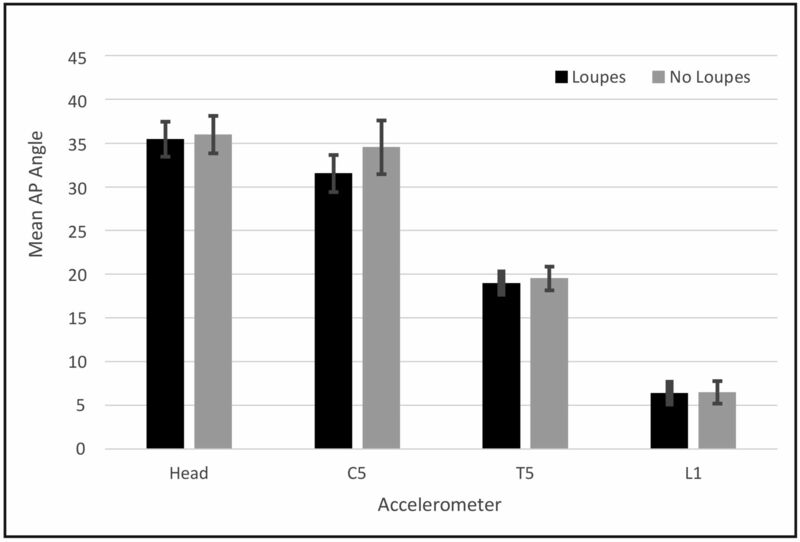 At T5, the accelerometer revealed no statistically significant difference in the APangle between wearing loupes (M=-18.99, SD=6.28); t(24)=.812, p=.425, and no loupes (M=-19.52, SD=6.82). Furthermore, there was no statistically significant difference in the MLangle while wearing loupes (M=.72, SD=3.55); t(24)=.659, p= .516, compared to not wearing loupes (M=1.06, SD=3.95). Lastly, the L1 accelerometer, revealed no statistically significant difference in APangle between wearing loupes (M=-6.41, SD=6.25); t(24)=.174, p= .863, and no loupes (M=-6.48, SD=6.31). There was also no statistically significant difference in the MLangle while wearing loupes (M=.72, SD=2.73); t(24)= .130, p= .897 as compared to not wearing loupes (M=.79, SD=3.53). (Table I and Figure 2, 3). A post opinion, self-report survey was completed to assess overall opinions of using magnification loupes. Results revealed that 74% of the participants strongly agreed that magnification loupes made it easier to explore, 22% agreed, and 4% were neutral. No participants disagreed or strongly disagreed with this statement. Chi-square analysis revealed there was a statistically significant difference between the frequencies of the ratings, χ2(2) = 21.56, p= .00. Results also demonstrated that 67% of participants strongly agreed that wearing magnification loupes improved their posture, while 26% agreed, and 7% were neutral. Again, none of the participants disagreed or strongly disagreed with this statement, and chi-square analysis revealed there was a statistically significant difference between the frequencies of the ratings, χ2(2)=14.89, p= .00. Therefore, the majority of participants tended to strongly agree that loupes not only improved their posture, but also made it easier to explore in all areas of the mouth. Musculoskeletal disorders occur at a high rate in dental hygienists and continue to negatively impact overall well-being.1-12 While ergonomically neutral postures help to minimize the movements attributed to MSDs, the very nature of a limited working field, static posture and fine movements, places high workloads on the neck and trunk. Dental magnification loupes may offer a means for improved ergonomic posture. Loupes, when properly fitted for working distance and declination angle, are designed to reduce the need to lean forward at the head, neck, and waist to give a magnified view of oral structures, thereby potentially minimizing the risk of developing work-related MSDs. Research related to posture and magnification loupes typically used subjective measures such as video and observer/raters to assess posture. At the time of this writing, the researchers were unaware of any other studies using accelerometers to quantitatively measure the difference in posture when wearing magnification loupes as compared to not wearing loupes. Findings from this study demonstrated no statistically significant differences related to AP and MLangle which suggests that wearing loupes had little effect on posture when performing instrumentation used in exploring. The angle findings at the head and neck (APangle) showed adopted positions far from recommended ergonomic guidelines while wearing and not wearing loupes. Adopted positions were significantly different from the participants' baseline neutral body positions for the head, (C5 and T5) recorded while participants were not wearing loupes. Interestingly, these deviations were very similar to the recordings made when participants were wearing loupes. In order to retain a neutral neck position, research states the head tilt from side to side and forward to back should be between 0-20°.25,26 In both experimental conditions, participant mean APangles were well out of this range for the head and C5, indicating that on average participants flexed their neck outside of the recommended range. Trunk flexion is also recommended to remain within the neutral 0-20° range.25,26 In both conditions, the average APangle at T5 was close to the maximum recommended value. With the mean and standard deviation exceeding 20°, it is clear that many participants flexed their trunks more than recommended. Data from this study suggests that whether wearing loupes or not, participants flexed their body far from the neutral position, resulting in less than optimal ergonomics. It is important to note that these findings were limited to a group of 25 dental hygienists who used self-supplied loupes in a wide range of styles and from a variety of manufacturers. The researchers did not evaluate the individually owned loupes for fit and declination angle. It remains possible that properly fitted loupes with an appropriate declination angle could reduce forward lean of the neck and trunk. This aspect of magnification loupes should be examined in future research. Prevalence of neck MSDs are exceptionally high especially in the dental hygiene profession, sometimes as high as 84%.5,6,7,12,13,27 Dental hygienists, despite ergonomic education and training, are not following the accepted recommendations to reduce MSDs, especially in the neck area. Furthermore, previous studies have indicated positive changes toward improved posture with the use of magnification loupes, however the quantitative results of this study could not support these findings. The APangle and MLangle results shown in Table I suggest that loupes do not affect posture of the neck and trunk, and that dental hygienists tend to flex their neck outside of the recommended range whether wearing loupes or not. These findings demonstrate minimal posture benefit when using magnification loupes. Regardless of whether or not magnification loupes improved posture during the present experiment, results of the survey show that more than half of all participants (74%) strongly agreed that they felt wearing magnification loupes made it easier to explore in all areas of the mouth. More than half of all participants (67%) strongly agreed that wearing magnification loupes improved their posture during exploring, however the data does not support this perception. The results from this quantitative study provide no evidence that wearing loupes leads to changes in body orientation and demonstrated that dental hygienists were operating far from optimal ergonomic positioning with and without the use of magnification loupes, potentially leading to MSDs. Several limitations may have influenced the findings of this research. Researchers did not record the type, fit or style of participant loupes. Loupes used by the participants may or may not have been fitted ergonomically i.e. measured for: proper working distance, depth of field, frame weight and size, and optical declination angle. If these factors had been evaluated, different results might have been obtained. Future studies should examine the use of ergonomically fitted loupes with steep declination angles and/or vertically adjustable flip-up loupes. Participants were not allowed to use the headlight mounted to their dental magnification loupes during the experiment which could have revealed differences related to posture. Dental hygienists were recruited using a convenience sample, rather than a random sample from the population. Only dental hygienists using magnification loupes were recruited for this study, it is possible that the introduction of magnification loupes could improve posture in this population when compared with individuals who do not typically use magnification loupes. Considering that the majority of this sample (n=15) was limited to novice dental hygienists practicing from 1 to 5 years, future research should consider comparing dental hygienists with varying levels of work experience. This study assessed posture while wearing magnification loupes during exploring, further studies should look into visual acuity, performance of dental related tasks and detection of pathology, calculus and caries. Future studies should also examine the use of dental loupes while performing other tasks such as hand scaling and periodontal debridement performed with ultrasonic instruments. It remains possible that appropriately adjusted loupes can reduce neck and trunk flexion. However, while the majority of the participants in this study felt that magnification loupes helped improve their posture (67%) and that wearing loupes made it easier to explore all areas of the mouth (74%); these perceptions do not match the quantitative measurements of this study. Emily A Ludwig RDH, MSDH is a graduate of the master's degree in dental hygiene program; Gayle B. McCombs RDH, MS, is a professor; Susan L. Tolle, BSDH, MS, is a professor; all in the School of Dental Hygiene; Daniel M. Russell, PhD is an associate professor in the School of Physical Therapy and Athletic Training; all at Old Dominion University, Norfolk VA.
. Predictors of work-related musculoskeletal disorders among dental hygienists. Int J Dent Hyg.2012 Nov 1;10:265-269.
. A systematic review of musculoskeletal disorders among dental professionals. Int J Dent Hyg. 2009 Aug 1;7(3):159-165.
. Musculoskeletal disorders (MSDs) and dental practice part 2. Risk factors for dentistry, magnitude of the problem, prevention, and dental ergonomics. Int Dent J. 2007 Feb 1;57(1):45-54.
. The effect of wearing loupes on upper extremity musculoskeletal disorders among dental hygienists. Int J Dent Hyg. 2014 Aug 1;12(3):174-179.
. Musculoskeletal disorders of the neck and shoulder in dental hygienists and dental hygiene students. J Dent Hyg. 2007 Jan 1;81(1):10-10.
. Prevalence and correlates of musculoskeletal disorders among Australian dental hygiene students. Int J Dent Hyg. 2009 Aug 1;7:176-181.
. Musculoskeletal disorders self reported by dentists in Queensland, Australia. Aus Dent J. 2006 Dec 1;51(4):324-327.
. The effect of loupes on neck pain and disability among dental hygienists. Work. 2016 Jan 1:1-8.
. Introducing loupes to clinical practice: dental hygienists experiences and opinions. Int J of Dent Hyg. 2015 Feb 1;14(3):226-230.
. Changes in posture: A case study of a dental hygienist's use of magnification loupes. Work. 2010 Jan 1;35(4):467-476.
. Physical workload in neck, shoulders and wrists/hands in dental hygienists during a work-day. Appl Ergon. 2012 Jul 31;43(4):803-811.
. Musculoskeletal disorders and symptom severity among Australian dental hygienists. BMC Res Notes. 2013 Jul 4;6(1):1-5.
. Prevalence of musculoskeletal symptoms and carpal tunnel syndrome among dental hygienists. Am J Ind Med. 2002 Sep 1;42(3):248-257.
. Musculoskeletal disorders in a 3 year longitudinal cohort of dental hygiene students. J Dent Hyg. 2014 Feb 1;88(1):36-41.
. Effect of magnification lenses on student operator posture. J Dent Educ. 2004 Mar 1;68(3):384-389.
. Effect of magnification loupes on dental hygiene student posture. J Dent Educ. 2008 Jan 1;72(1):33-44.
. Ergonomic benefits of surgical telescopes: selection guidelines. J Calif Dent Assoc. 2008 Feb;30(2):161-169.
. Surgical magnification in dental hygiene practice. Int J Dent Hyg. 2004 Feb 1;2(1):26-35.
. The effect of magnification loupes on the performance of preclinical dental students. Quintessence Int. 2011 Jan 1;42(1):45-55.
. Magnifying loupes in modern dental practice: an update. Dental update. 2010 Nov;37:633-636.
. Enhanced visualization using magnification systems. J Dent Hyg. 1997 Fall;71(5):202-206.
. Declination angle and its role in selecting surgical telescopes. J Am Dent Assoc. 1999 Jul 1;130(7):1096.
. A new method for evaluating motor control in gait under real-life environmental conditions. Part 1: The instrument. Clin Biomech. 1998 Jun 1;13(4):320-327.
. A new method for evaluating motor control in gait under real-life environmental conditions. Part 2: Gait analysis. Clin Biomech. 1998 Jun 1;13(4):328-335.
. Are neck flexion, neck rotation, and sitting at work risk factors for neck pain? Results of a prospective cohort study. J Occup Environ Med. 2001Mar 1;58(3):200-207.
. Fundamentals of Periodontal Instrumentation & Advanced Root Instrumentation. 7th ed. Baltimore, MD: Lippincott Williams & Wilkins; 2012. 10-12 p.
. Prevalence and risk factors of upper extremity cumulative trauma disorder in dental hygienists. Work. 1998 Jan 1;11:263-275.